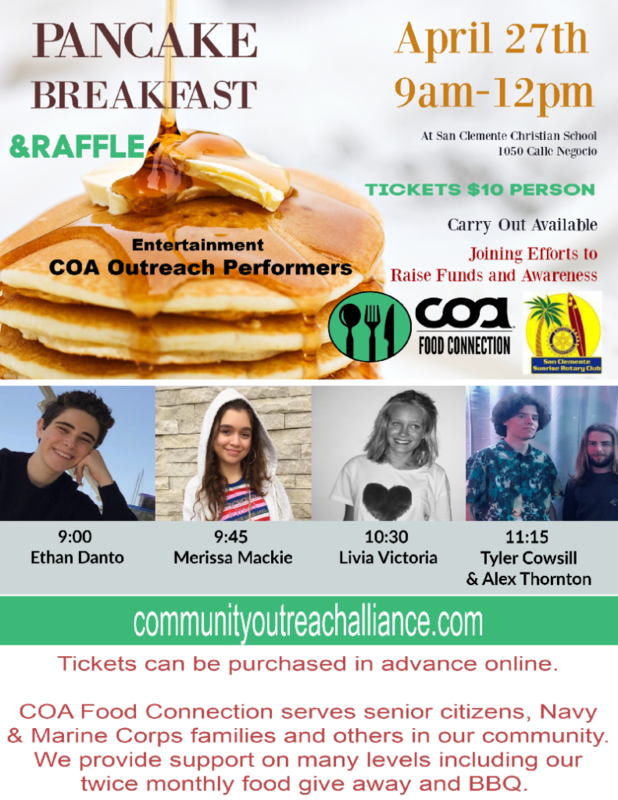 COA (Community Outreach Alliance) is a non-profit organization in San Clemente. Our goal and mission are to offer fun and healthy activities to our community that has been deeply affected by the drug and addiction epidemic. We seek to partner with sponsors, local businesses, and individuals to come alongside us and help create opportunities for youth seeking a healthy alternative to drugs and addiction. Thrive Alive is a new and innovative program offered by Community Outreach Alliance. We want to help support the middle school and high school students in our community. Our program will educate students on the current culture that can draw them into making unhealthy choices. COA will also offer weekly activities with an adult mentor that help the students thrive in life. Our goal is that all students feel respected, appreciated and valued. Will YOU Make a Small Donation Today? We need your help! You can help now by supporting COA! Donate to COA because keeping the youths off the street can’t wait! We do our BEST as a Non-Profit providing activities and education for those choosing a healthy lifestyle. We do our BEST to work with other agencies in an effort to bring our forces together (the alliance) to help more youth choose a life that’s drug and alcohol-free and full of possibilities. Relay for Life, Chowder Cook-Off, Red Ribbon Parade, Ocean Festival, concerts and special events at our COA venue are ongoing throughout the year. What an amazing organization and group of people who’s sole purpose is helping teens make healthy choices and decisions for healthy living and tools to say no to drugs and alcohol and prevent suicide. I am so thankful my son has these wonderful people in his life to educate and inspire him to try new things and live healthy! Thank you so much!!! Interning with COA has been an overwhelmingly positive experience. They have given me the opportunity to design fliers, posters, and social media campaigns for each organized event. This has helped me expand my portfolio all while exercising my abilities to support the community. Not only does COA offer a positive work environment, they are interested in the growth of every individual. COA is supportive of interns establishing new connections that will advance them in their future endeavors. Coa has given me the opportunity to try anything once to see what I like. I’ve gained confidence knowledge and leadership from COA I made lots a friends and outlets I can talk to about anything COA has changed my life and made me a better person. COA's Internship program provides opportunities for young adults to build their confidence and gain experience to pursue their passions. I am very thankful for the opportunity COA provided me prior to starting my career with UC Irvine Athletics. 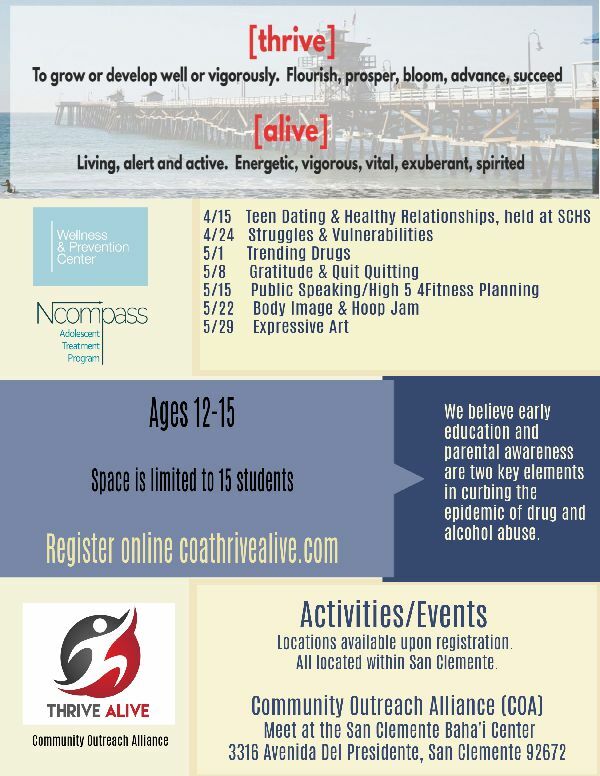 Community Outreach Alliance (COA), a 501 c3 non-profit service was established in 2014 in San Clemente, California by visionaries Pondo Vleisides and Teri Steel who saw a need to foster a positive solution for the young people in the community who were battling the throes of drug use and addiction.